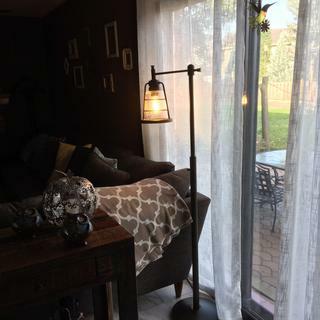 A handsome oil-rubbed bronze finish and seedy glass combine to create a unique industrial-inspired floor lamp. This sturdy downbridge floor lamp from Franklin Iron Works™ brings a fresh take to the time-honored style of industrial design. Inspired by farmhouse and factory lighting, the smooth, oil rubbed bronze finish offers a handsome richness to your space while the Edison-style bulb casts a warm and inviting glow through the seedy glass shade. Downbridge design makes this lamp great for reading or beside your favorite chair. Overall: 61" high. With top light, 19" wide. Round base is 12" wide. Includes one standard-medium base 7 watt LED Edison-style bulb. On-off light switch on the pole. Bulb can be dimmed, dimmer is not included. Socket rated up to 60 watts. 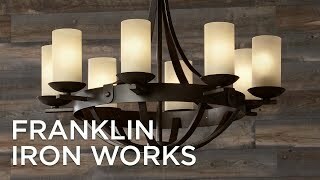 Industrial downbridge rustic farmhouse floor lamp from the Franklin Iron Works brand of lighting. Oil rubbed bronze finish. Metal construction. Seedy glass shade. This lamp will complete my TV room. Industrial lamps with Edison bulbs (don't forget dimmers) allows you to fine tune the light just right! 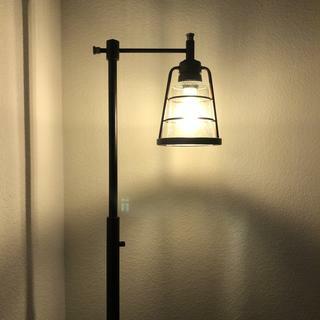 I purchased a different industrial lamp with three Edison bulbs from Lamps Plus a few months ago. Looks fantastic! Perfect for sitting room behind a chair. This one is more modern than the Pharmacy Lamps. To go with my Averill Park Industrial Downbridge Table Lamp. No one else will have this. It's very cool. 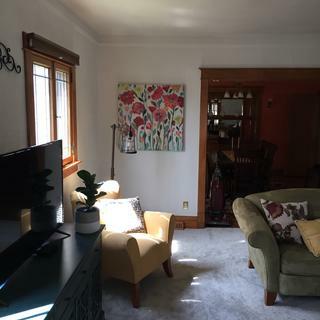 It will add texture and drama to the room I'm redecorating in our 1905 farmhouse. Reviewers didn't mention that the light might be a little too glaring, which does concern me. I will be using it beside a large comfy chair, for reading. quality construction, looks beautiful and will fit in to the decor of my home. Matches similar light that we bought from you. It complements my seeded glass table lamp without being too 'match-y'. My significant other liked the design. Fits our decor! I think it would match a previous lamp I purchased. Already had - wanted another one. 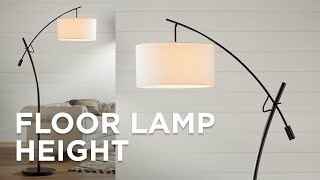 Does this lamp adjust in height? Is the power switch on the pole or on the cord? BEST ANSWER: Hi, the on/off switch is located on the pole of the lamp. It's on the pole; very convenient. It is on the pole. Cord doesn’t show, does it? BEST ANSWER: The cord runs down the vertical column, then into & out of the base. The only cord that shows is that which is between the base & where it’s plugged in. Just the cord from the lamp to the outlet. Base has room to wrap extra cord. 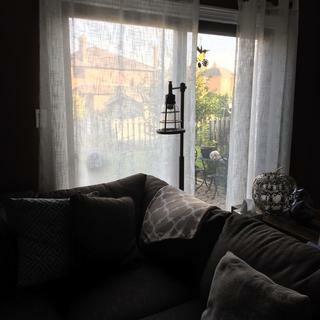 Can this lamp be used outdoors? We don't know. We only used it for indoors. 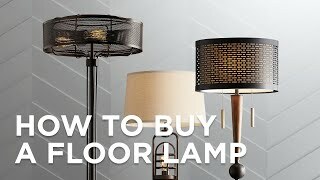 Can i put a 100 watt bulb in this lamp? I want to use it for reading. BEST ANSWER: Hi - yes, you may use a higher equivalency LED bulb. Generally, a 16 watt LED bulb would be equivalent to a 100 watt incandescent light bulb. I prefer the regular bulbs vs LED ones. I like the lighting that they give off. Can i use 100 watts of that kind of bulb? Yes, you can use an LED bulb that has a light output of 100W. The maximum is 60 watts for a regular incandescent light bulb. There should be a sticker near the base of the bulb that indicates max wattage for an incandescent bulb. But if you put a "100 Watt Equivalent" LED bulb into the unit, you'll be just fine regardless because the thermal output of such a bulb is only 10-20Watts. Pick a light color that you like. For reading, I'd go with 3000K or higher vs the more "yellow/red" looking 2700K. Maybe if you use an LED bulb..
Do u have to assemble?? BEST ANSWER: Hi -yes, this requires assembly. Yes; but it's very easy. BEST ANSWER: No the height is not adjustable. We have it at end of our couch and height is perfect. 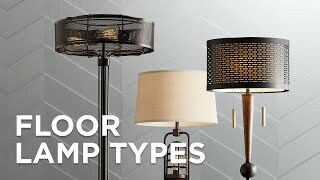 Love the lamp and get lots of compliments on it! No. It is fixed, but it is a good height for reading. Is the shade on this tiltable? Hi, I am interested in the lamp you reviewed. I'm thinking of putting it between two recliners where we watch tv, but need something that won't create a glare. Would this work? Hi, the Edison Style LED bulb included does not tend to cause a glare. Perfect mix of rustic and industrial. Using for reading and ambiance in a dim area of living room. It's the perfect light for my room for watching television and relaxing. We really enjoy our lamp. We use the lamp as a reading lamp from behind our couch. Works great. 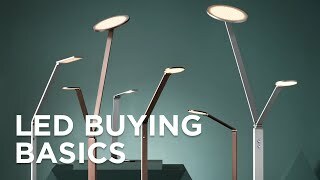 High quality and unique lamp. Coordinates well. I love this lamp. I also have the table lamp from this collection and I love the way they coordinate without being overly matching. It’s very high quality and I’ve gotten tons of compliments on it. Highly recommended. Love this lamp. Added it to my family room for some reading light, but bright enough so that we don't need to turn on any other lights in the room. It compliments the room beautifully. Easy to assemble - satisfied with my purchase. The lamp we got from your store fits in with the den we put it in. It is the best light for my cozy chair, to read by.. This is the perfect corner lamp and great for reading. The bulb is bright so I purchased a dimmer from another source and it works beautifully. Fantastic floor lamp. The bulb emits the perfect amount of warm light. If you want a classy industrial look, this is the lamp for you. This is a beautiful lamp. I love the seedy glass shade. Came very well packed and fairly easy to assemble. The only stumbling block was securing the glass shade. The bulb socket actually unscrews so you can attach the shade to the lamp before you put in the bulb. Highly recommend. This lamp looks exactly like the photo. Good quality, easy to put together, base has room to wrap extra cord! Perfect for my office. The quality is top notch and they look great in my living room. Nice weight so there is no ‘sway’ like happens with cheaper lamps. Great design and well made. Love the lamp. Not super bright, but it's perfect beside my bed for a reading lamp .Gives a softer glow, not a harsh light. Looks perfect with a nautical feel. Very happy with purchase. Well made. We have this lamp in a reading area close to a chimney left over from when our 1905 farmhouse was heated by pot-belly stoves. The effect against the faded old bricks is perfect. The bulb supplied is a retro "Edison" type, which I love. The only thing I wasn't wild about (thus 4 rather than 5 stars) is that although the lamp is supposed to be dimmable, I didn't find any way to make that happen. I had to buy a $17 lamp dimmer that plugs into the wall, then the lamp plus into that; a small white control sits unobtrusively on a nearby shelf. This allows me to adjust the brightness of the lamp from a soft amber light perfect for reading all the way up to 100% intensity, which I found glaringly bright. The lamp is substantial, very heavy and has a nice matte finish that looks rich. I put it together myself but it would have gone more smoothly with a helper. Hi M A., sorry for any confusion! The LED bulb included with this design is dimmable, but the lamp itself has an on-off switch. Since not all LED bulbs are dimmable, including the dimmable bulb makes it easier for those would like to add a dimmer switch to the design such as you did. Thank you for the review! The lamp has a really nice design. It’s on the shorter side than what we envisioned. Also, the bulbs suggested for the lamp do not provide good lighting. The lamp is definitely more on the decor side than a useful purpose.